Twins join Angelina Jolie – Brad Pitt | PinOy SPY! 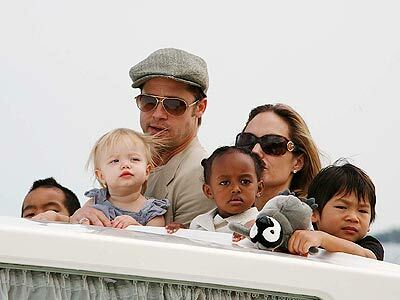 Angelina Jolie gave birth to a son and daughter in Nice, France with Brad Pitt at her side. The actress delivered her twins by Caesarian section at the Fondation Lenval hospital on Saturday, Kuly 12, 2008. The baby girl was named Vivienne Marcheline, after Jolie’s late mother Marcheline Bertrand, and baby boy Knox Leon. They weighed 5 pounds (2.27 kilograms) and 5 pounds 3 ounces (2.35 kilograms) respectively. Vivienne Marcheline and Knox Leon joined the celebrity couple’s adopted children Maddox, 6, Pax, 4, Zahara, 3, and biological daughter Shiloh, 2. Terrific read! I have a single suggestion for your website. It looks like there are several cascading stylesheet problems when launching several webpages in google chrome and safari. It is functioning good in internet explorer. Probably you could double check that. I’ve just saved this content on stumbleupon.com to acquire some more visitors to your web page. | PinOy SPY!. It proved to be very useful to me and I’m certain to all the commenters here! I’ll grab your feed, please keep writing!